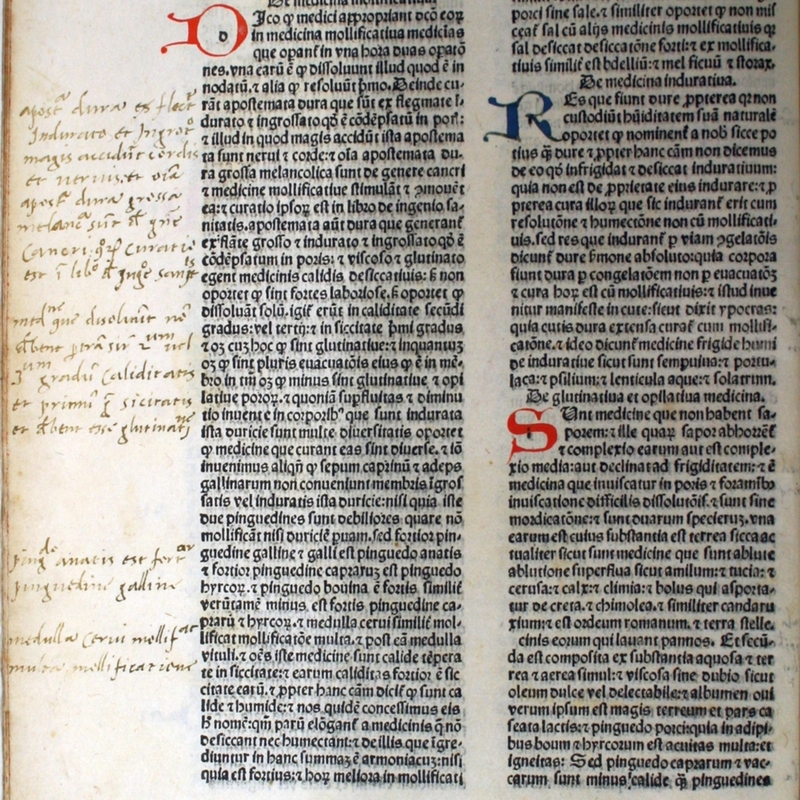 Liber Serapionis aggregatus in medicinis simplicibus... Translatio Symonis Ianuensis interprete Abraam Iudeo tortuosiensi de arabico in latinum. 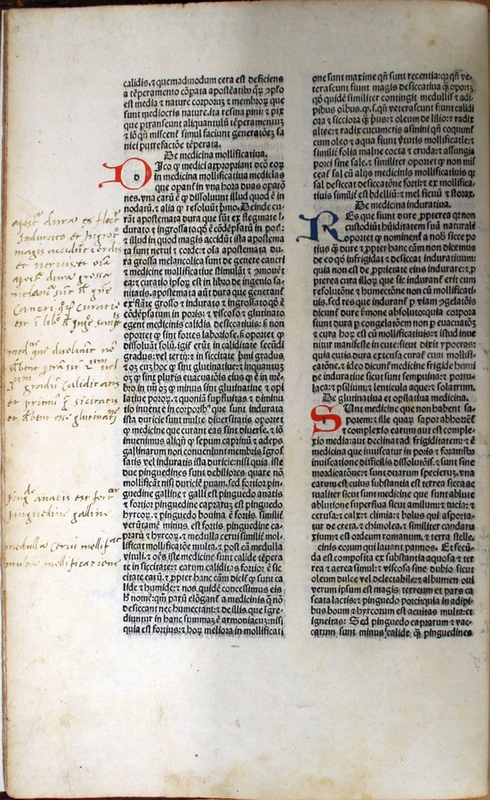 Liber Serapionis aggregatus in medicinis simplicibus. 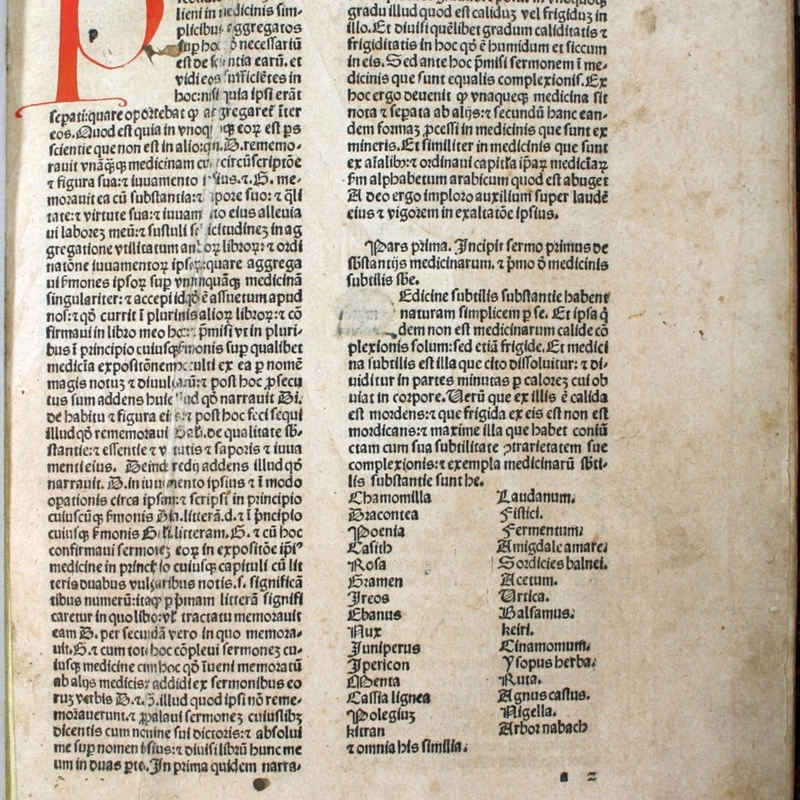 Translated by Simon Genuensis and Abraham Judaeus Tortuosiensis. Add: Galenus [pseudo-]: De virtute centaureae. Translated by Nicolaus de Regio. Provenance: Royal College of Physicians & Surgeons, Glasgow: armorial bookplate on front pastedown “Library of the Faculty of Physicians and Surgeons Glasgow” bearing superseded shelfmark in ink “49 i 16” and partially overlaid with a later armorial bookplate of the College; shelfmark repeated in pencil on a2r; possibly purchased by the College in 1869/1870 since the Librarian’s annual reports in the Faculty minutes of 1869 and 1870 both make special mention of purchases of “works of the older medical authors”; source unknown; first appears in Alexander Duncan’s 'Alphabetical catalogue of the library of the Faculty of Physicians and Surgeons of Glasgow' (Glasgow: 1885). Binding: 18th-century blind-tooled calf; covers decorated with a triple fillet to form two concentric rectangles, the inner rectangle decorated with a floral roll along its inner edges and with a floral ornament at each outer corner; sprinkled red-edged leaves; rebacked (20th century); original title label put back, original pastedowns retained but given new free endpapers; one original flyleaf at rear with watermark “H L”. Fairly frequent marginal annotations in a humanist hand (some slightly cropped); occasional pointing hands; early manuscript foliation in ink “1”-“133” (some numbers cropped); manuscript references using that foliation added to the index on a4v-a6v; early number “litt. 563” in ink on r6v; 18th-century(?) code “Cl dm” in ink on front pastedown, together with numbers in pencil “18”, “42”, “2”; 19th-century code “s/f”(?) in pencil on rear pastedown. Initials supplied in alternate red and blue throughout; occasional paragraph marks in red. Wanting gathering [*] and the blank leaf a1. Signatures: Fol. [*]2 a10 b-f8 g10 h-i8 k6 l-p8 q-r6. leaves (leaf 3 blank). Serapion, the younger, active 12th century. Anno domini M.cccc.lxxix die octauo mensis Junij. 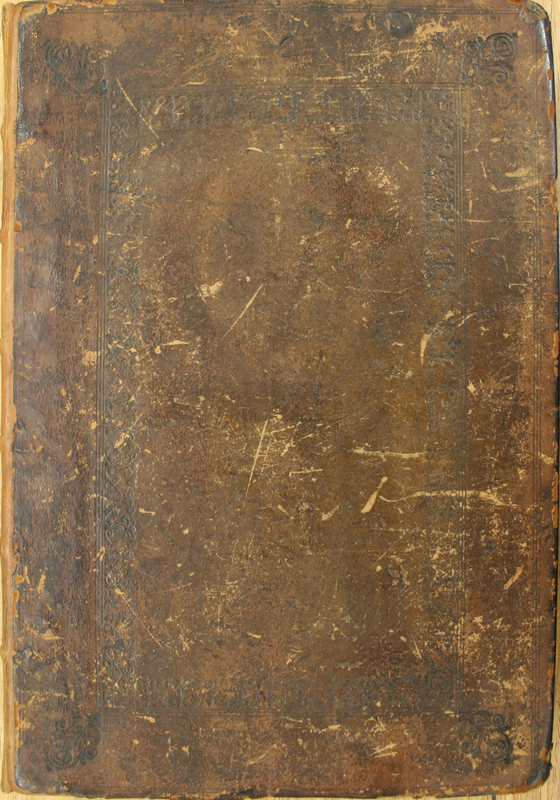 Bound as the first item with: Serapion, Johannes, the Elder. 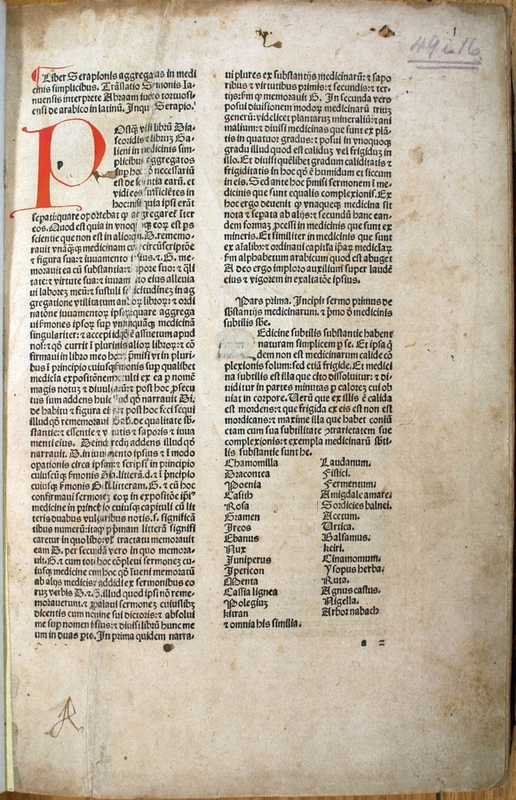 Breviarium medicinae. Venice: Reynaldus de Novimagio, 1 Aug. 1479. The latter includes a general colophon for both works. Leaf size: 293 x 203 mm. Binding: 303 x 210 mm. Serapion, the younger, active 12th century., “Liber Serapionis aggregatus in medicinis simplicibus,” Heritage, accessed April 23, 2019, https://heritage.rcpsg.ac.uk/items/show/816. Description: Liber Serapionis aggregatus in medicinis simplicibus... Translatio Symonis Ianuensis interprete Abraam Iudeo tortuosiensi de arabico in latinum. Creator: Serapion, the younger, active 12th century. Date: Anno domini M.cccc.lxxix die octauo mensis Junij. Relation: Bound as the first item with: <a href="https://heritage.rcpsg.ac.uk/admin/items/edit/815">Serapion, Johannes, the Elder. 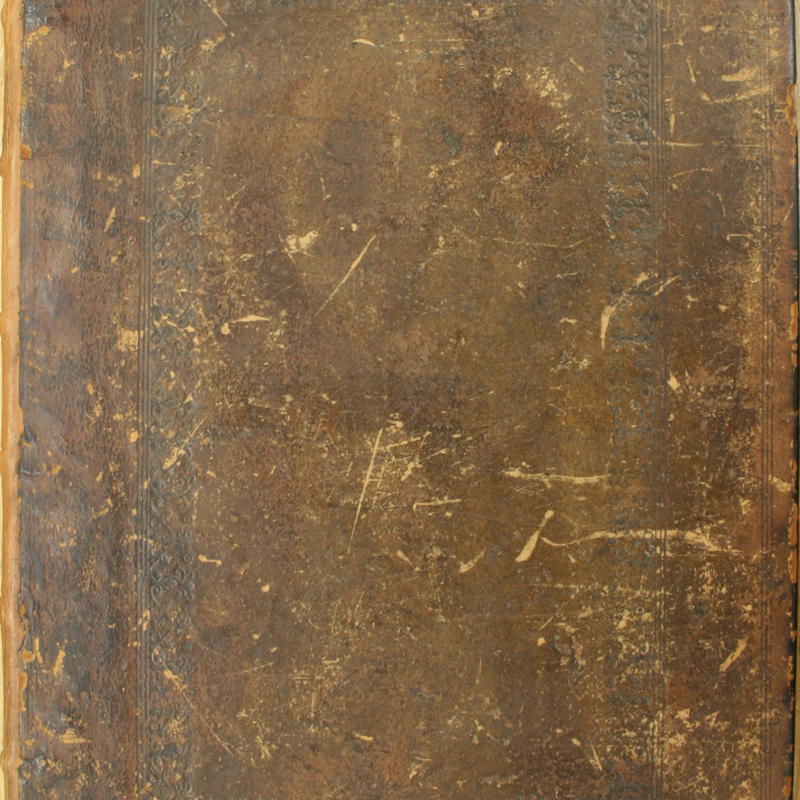 Breviarium medicinae</a>. Venice: Reynaldus de Novimagio, 1 Aug. 1479. The latter includes a general colophon for both works.